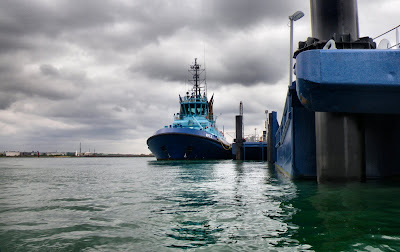 The blue tugs that guard the entrance to Southampton Water provide an excellent point of reference for the short crossing from Warsash to Ashlett Creek. Arriving with the tide ebbing fast there was little time to explore this scenic little estuary, (although some did try and paid the penalty....., lets just put it this way; they'll be hoping that Persil is as good as the adverts say it is). We carried on, passing the large modern day monolith at Fawley, pausing now and then to play in the gentle wake of the larger vessels leaving Southampton Water. We rounded Calshott Castle where shortly after, we crossed an unusual buoyed area before realising that we had interupted the start of the local model club power boat race... errr... Sorry folks! (they weren't too happy - they had a tanoy and everything). After hitching a lift on the Westbound tide we hauled out on a steep shingle beach in front of the multi coloured beach huts a mile or so to the West of Calshott (and just far enough that we lost sight of the shaking fists of the model club'ers). After lunch we attempted to retrace our wakes to Calshot but were thwarted by the receding tide and the now exposed gravel bar, those with shiny fibreglass opting for the wider route before continuing en masse to the entrance of Southampton Water. After waiting for the larger traffic to abate we crossed the entrance, our route interlaced with those of the numerous craft that busied themselves with their own agenda's.